Thread: Advice on a used frame bought off Ebay. Hey everyone, I recently bought a 1991 Cannondale sm700 frame off Ebay and it arrived with some issues undisclosed in the listing. Before I get to the issues the frame was bought as a beater, or at least a bike that looked like a beater for riding through risky areas of town where I don't want to risk one of my other bikes. I knew the paint was in rough shape and the steel Ritchey fork would be missing paint and have some rust. Not a huge deal for me. 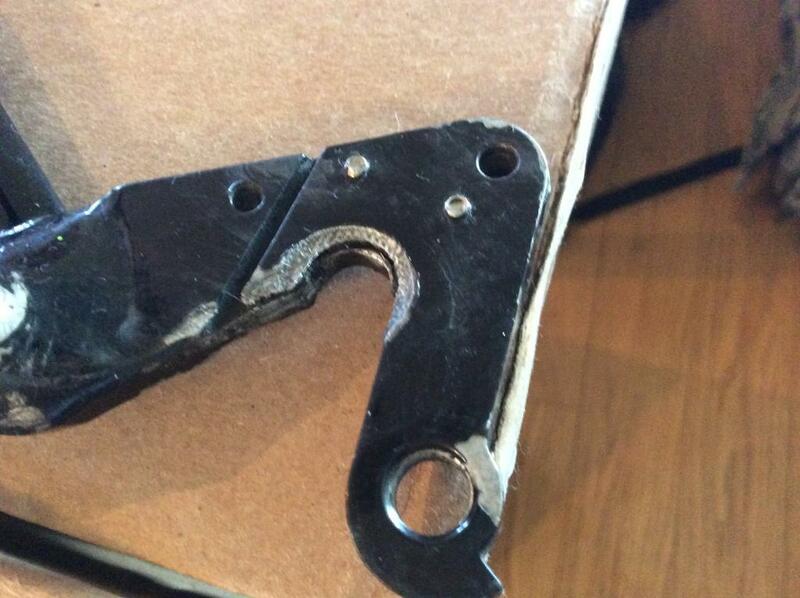 When the frameset arrived the rear derailleur hanger was recessed about a sixteenth(maybe slightly more) of an inch with the recessed area being quite rough and the edges being rounded off. It appears the rear wheel was ripped off under tension or maybe the rear quick release was way over-tightened. The side opposite the hanger is also pressed in a bit. In regards to the paint there was an area I wrote and asked the seller about directly whether or not it was missing paint. I was told it was the remains of a sticker. This turned out to be false and it was in fact a large area of missing paint. In addition there is a fair amount of debris inside the frame that rattles around when the frame is turned at different angles. I paid more that I should have because I have a soft spot for the 1991 Cannondale's so the idea of putting any more money into the frame isn't practical. At the price I paid and according to the listing it should have been ready to go. Am I right to be pissed that these issues weren't listed? I don't think the hanger is shot but it's definitely taken damage and I certainly would not have considered the frame at the price I paid had these issues been disclosed. Any thoughts? Am I over reacting? I'm new to this sort of thing and I don't want to give the guy a hard time unless it's warranted. I've added a picture of the hanger. Last edited by kramazeek; 02-11-2017 at 02:37 AM. Its hard to give any feedback on this without reviewing the Ebay ad, knowing the price you paid for the frame and more pictures of the frame after you received it. Hey 410sprint, I take your point but I'm not looking to see if I was taken in the deal, merely what peoples expectations are on 25 year old frames on Ebay. Below is the description for the listing. 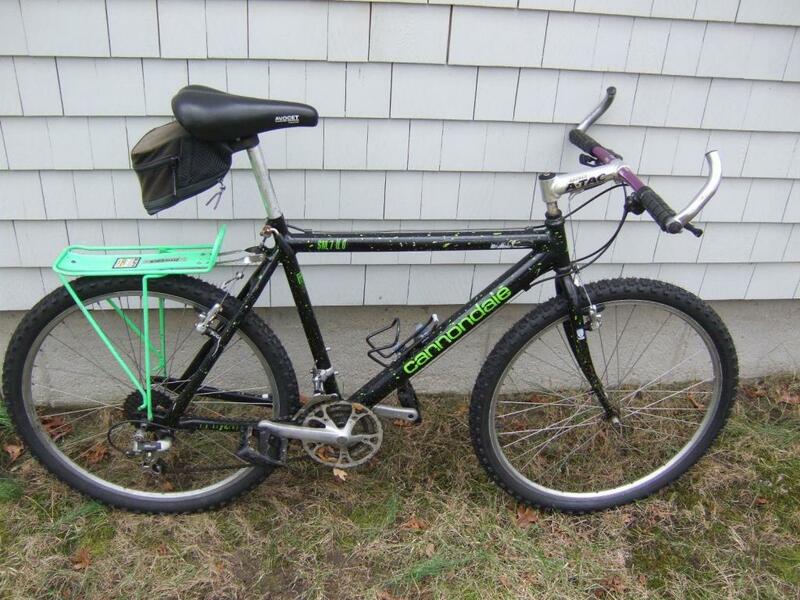 "This listing is for a Cannondale SM700 classic old school mountain bike. Has all new tires, rim guards and tubes, pedals, basic lube. Has 21 speeds with the Shimano Rapid Fire shifters, not sure if all stock, but it rides well and stops fine. There are some scrapes and minor rust here and there but still very presentable. I prefer local pick up but could work with buyer on shipping at buyers expense. The frame number is 5181190676." On a frame this old would you expect a seller to be forthcoming about debris inside the frame and moderate damage to the rear derailleur hanger in the listing or would you feel that this is an old frame and that is the risk one takes? Based on some metal loss on the hanger and debris in the frame would you call the above listing appropriate? I would add that the pictures in the listing were of a complete bike and the seller then parted out what I needed due to a lack of interest. There were no pictures of the dropout in the listing. The guy did me a favor by breaking the bike down on one hand but he also gave false info(he's an older dude so I'm on the fence if it was deliberate) about paint missing under a sticker and didn't disclose the hanger damage and debris in the frame. I agree. Without this information there is no way to say. With that said, you are buying a 26 year old frame! Unless the guy said it was in like-new condition and barely ridden, then a buyer ought to assume its going to have 26 years of wear. It is a mountain bike after all, so 26 years is a lot of beating. The fact that you paid more than you should have because you "have a soft spot for 1991 Cannondales" is not the seller's fault, thats on you. I can tell you that ebay is very pro buyer and anti seller, so if you put in a not as described dispute you will win and can get your money back. You would just have to eat the shipping to send it back to him. Found it. I don't really see anything deceptive here, and the price isn't ridiculous (though I wouldn't have paid more than $50 for that whole bike). He also says "I think that is just part of a missing decal" in regards to the mark on the top tube. Nothing deceptive about what someone thinks, he just happened to be wrong. This is interesting and I appreciate the feedback from previous responses. Again, I'm not looking to see if I got screwed but I'm genuinely curious about what people here feel about what they are ethically obligated to disclose in a listing when selling a frame or part. I am going to push back a bit. Just because a bike is 26 years old doesn't mean it was was ever rode on a trail. Or rode hard for that matter. I've seen plenty of old frames that were scratched up with considerable damage to the finish that did not have debris rattling inside the frame nor moderate damage to the dropout. If it were not the sellers responsibility to disclose these two fairly obvious defects, one defect the bidder would be able to see from pictures, and one defect in which the bidder would have absolutely no idea unless disclosed by the seller, then all frames over a certain age would carry the same value at the lowest common denominator. As a seller I try to describe every defect to protect myself and allow people that buy from me the ability to gauge what they are willing to pay accurately. That is my responsibility. Am I alone on this idea? If the seller isn't going to even try to describe the item or list damage then wouldn't it make sense to specifically include "as is" in the listing, if anything, to protect their own interests? Is it the consensus that such details need not be disclosed? Even something as obvious as debris rattling around inside the frame? Any one else have any thoughts? IMHO, you screwed yourself by paying WAY too much for an aluminum frame bike that was notorious for cracking. I went through 4 broken C'dales in that era before moving on to other manufacturers. Fair enough, but with respect, whether or not you like the frames or whether or not I got screwed isn't the issue. The issue is what people here feel is reasonable to disclose in a listing? I have had brand new frames, rims and other bike parts that have things rattling around inside. I believe a seller should do their best to describe the general condition of something they are selling. If someone who is selling a 26 year old bike were to describe everything that is not like new it would make for a ridiculous ebay listing, probably pages long. In your specific case it comes down to you wanting something that is in great condition even though it is 26 years old. No where in the sellers ad does he use terms like "like new", "great condition", "perfect" or anything that should lead one to believe that it was anything other than what it was. To be honest you are just one of those people that has awfully high expectations for a 26 year old used item, so I don't think most people would agree with you. So rather than coming on here trying to get people to agree with you, just put in a paypal claim, send the frame back and get your money back. That should make you happy and thats all that matters. Also FYI, according to the law, when you sell anything used it is sold "as is" unless specified otherwise by the seller. "Used : An item that has been used previously. The item may have some signs of cosmetic wear, but is fully operational and functions as intended. This item may be a floor model or store return that has been used. See the seller's listing for full details and description of any imperfections." You had said "If someone who is selling a 26 year old bike were to describe everything that is not like new it would make for a ridiculous ebay listing". "For sale, a used 1991 Cannondale sm700. The frame has many small chips and scrapes, two very large scrapes on the top bar, and a hairline scrape by the rear brake mount. The Ritchey steel fork is missing paint and the underlying areas have rusted. The rear dropout shows moderate loss of metal as well as some scoring and teeth marks on the opposite side of the dropout. The frame also has some loose debris inside that slide when the frame is turned. With a bit of love these issues can be resolved. Frame would make for a great restoration project or a commuter beater." That is an honest description that took about 20 seconds to write up. It's not hard to give the bidder the information needed to make a sound decision concerning what they are willing to pay for a used item. Thanks again though, it's all food for thought I guess. Just bought a 2008 epic frame on ebay. Should I sell it and never look back? Just bought a Rize two frame on EBAY the seller said it was the carbon version. Anyone ever bought any of the Sobike stuff off of eBay?